Sam Bell, Dr. Kathryn Duda, Tad Brubaker and Sam Brilliant recieved the Volunteer of the Year Awards at the annual Volunteer Appreciateion Party. MEF's Auxiliary Board Jack Diamond talks about his experiences tutoring, exciting plans for the Auxiliary Board and this year's rooftop Soiree. Congrats to tournament winners AIM Consulting! Together, we raised over $11,000 for MEF kids! Couldn’t make it the kickball tournament, but want to give back? Consider joining Midtown or Metro as a volunteer this school year! MEF provides a great opportunity to give back to a population that can really benefit from your time and your knowledge..
January is National Mentoring Month - Thank You, MEF mentors! Chicago — In honor of Thank Your Mentor Day during National Mentoring Month, we would like to take this opportunity to recognize some key difference-makers -- the mentors of Midtown Center for boys and Metro Achievement Center for girls. At Midtown and Metro, over 300 volunteer tutors and mentors dedicate weekly mentorship to at-risk youth from over 100 different schools across Chicago. Uniquely paired with the same child over the course of the year, each mentor serves as a guide and role model, imparting life lessons, career exposure, and hope for the future. The National Mentoring Partnership commissioned the first of its kind national report called The Mentoring Effect. According to the report, "The survey shows that one in three young people will reach adulthood without connecting with a mentor of any kind...This finding suggests a systemic shift to leverage quality mentoring programs to introduce mentors to young people who face a greater number of risk factors is a powerful and necessary strategy." Our very own Executive Director Glenn Wilke serves on the steering committee of the local chapter, the Illinois Mentoring Partnership. This year, MEF celebrates 100% high school graduation and 100% college enrollment for the last 14 consecutive years. Moreover, out of 900 MEF alumni surveyed, 91% are still in college or are college graduates. Thank you, Midtown and Metro mentors! Chicago — We at Midtown Educational Foundation often use the phrase A. V.I.P. to describe the youth development model Academics, Virtues, Individual Attention, and Parent involvement at Midtown for boys and Metro for girls. But for now, at the heels of January's National Mentoring Month, we want to recognize our very own V.I.P. Dr. Jorge Peña, a generous man who has dedicated thousands of hours as a mentor and role model for at-risk Chicago boys at Midtown Center since 1998. When Dr. Jorge Peña began volunteering at Midtown, he realized no program existed for high school seniors. So he did something about it. He received approval to develop a College Seminar course to help at-risk Chicago male seniors learn the ropes toward college admission. Launched in 2002, the program lives on today. During the fall semester, seniors focus on the college application process. In the spring, they cover financial aid, scholarships, affordability, and adjusting to student life from an academic and social point of view. "I see these really transformative changes. They come from neighborhoods that often do not have high levels of expectations for learning, because the academic achievement of students in those neighborhoods tends to be depressed and very low. We emphasize college admissions, college enrollment, and graduation." Looking back on Dr. Peña's influence at Midtown, it is no surprise that Midtown Educational Foundation celebrates 100% high school graduation rate and 100% college enrollment for the last 14 consecutive years. "Currently, out of our senior class, 2/3 will be the first in their families to go to college." In a recent survey of over 900 alumni, 91% are still currently enrolled or are college graduates. Where did this inspiration come from? "My mom was a teen mom, and I had struggles with the college application. A Yale medical student would come to my house with his typewriter and helped me with my applications and edited my essays." Growing up in a neighborhood exposed to gangs and drugs, the students at Midtown relate to Dr. Peña, as he can truly relate to them. Not only does he come back each week to teach the College Seminar, he also goes out of his way to provide the same opportunity for his own nephew. "I work downtown. Every Monday night I drive past 115th St. to pick up my nephew and bring him back north to Midtown. I value the program and see how much of an impact it's making on him in different ways." Apparently many dedicated families commute 30-40 minutes or more to attend Midtown and Metro each week as well. "'l'll be honest, it's not easy to volunteer...it's becoming more challenging...but knowing that resources may be scarce at most schools (1100 or more students to one college access counselor)...and receiving student emails asking me to review their college essays -- that's what brings me back is my own experience as a high school senior." "As a doctor of education, I began to really look at how well Midtown is having an impact on these students...because it put in students' minds that regardless of your surroundings, this is the path towards life's success." It's this kind of support that "helped me escape my adversarial conditions." - Exposure to various cultures - Students have a chance to meet other 4th-12th graders outside of their neighborhoods from over 100 schools across Chicago. "A hidden value is that our students are exposed to those who are not like them and they get the opportunity to learn how to interact with young professionals." - The A. V.I.P. Model - "It truly permeates throughout the entire organization. I've seen the evolution of the Academic programs here; in the summer, it functions like a school! I get to talk to my nephew about the Virtues he's learning. The series of one-on-one interactions with the advisor promotes Individual attention. And it's the Parent component I find often missing from other programs...That, I believe, is the cornerstone of the program. It really convinces me and continues to inspire me to come back." - Persisting High Quality Programs - "I've seen different program managers and directors come and go through the years, but what is consistent is the strength of the program quality that we offer. The programs are incredibly well developed and structured." "Education is one of the only fields you don't see an immediate return on investment. It's long-term." Fortunately, Dr. Pena has been around long enough to witness the ROI on his students. A former student at Midtown who struggled intensely with math recognized Dr. Pena years later. "You taught me Physics right here at Midtown in 1998. I was so excited about Astro Physics, Physics, Quantum Physics - it was my first time exposed to it, and I turned my math grades around. I graduated with a Bachelor of Science in Physics at Illinois Institute of Technology. Now, I am exploring PhD programs in Astrophysics, and I volunteer as a mentor at Midtown because of the impact it had on me." and commitment for more than 16 years at Midtown! Dr. Jorge Peña served as the Assistant Principal at De La Salle Institute for 12 years and is currently the Director of School Improvement and Catholic School Accreditation at the Archdiocese of Chicago. He leads the accreditation process for 206 local elementary schools, in addition to Chicago area Catholic high schools. 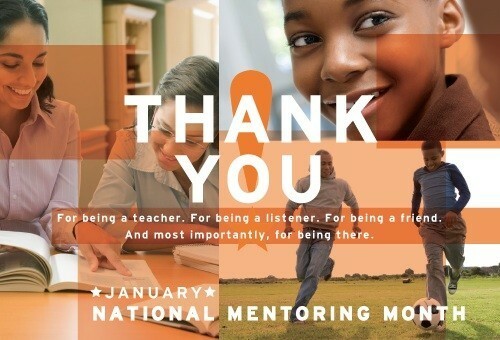 Chicago — Today is Thank Your Mentor Day, part of a month-long celebration of National Mentoring Month. Exactly one month ago today, Midtown Educational Foundation honored its Volunteers of the Year at the Annual MEF Christmas Party. In honor of Thank Your Mentor Day, we would like to take this opportunity to acknowledge Cathy White and Kevin Saghy for their dedication and generosity with our Midtown Center for boys and Metro Achievement Center for girls. "I always say I get more from the girls at Metro than they get from me. No matter how tired I am at the end of long work day and how little I may feel like spending another two hours on-the-go, I always leave Metro more refreshed, happier, and a better person than when I came there," says White. Cathy is the Executive Assistant to the President at the National Merit Scholarship Corporation in Evanston. She has been involved with MEF for over 7 years. When she can, she volunteers two nights a week and in general is always ready to go the extra mile to promote and help out Metro programs. "I'm repeatedly surprised by the joy I find in my friendships with the Metro students (who knew I had so much in common with inner-city high school students?! ); but it's also the staff and other volunteers at Metro who make it the homey, cheerful place I want to keep coming back to. Because Metro is built on personal, individual relationships, it's easy to commit to coming there every week. Rather than a general feeling that I want to serve society at large, this is a personal response to people I know. Metro is about friendships with individual people! And just as any friendship is a mutual self-giving that offers each party joy, so my relationships with all those I meet at Metro give me as much (or more) help as I give them. Coming to Metro is like coming to a friend's house." "There are few feelings better than knowing you're making a difference in someone's life, and that feeling happens almost every week when volunteering at Midtown," said Saghy. For the last five years, Kevin has served as a one-on-one mentor to the boys at Midtown Center. He is a true role model to the young men, going beyond coaching them in how to behave with responsibility and integrity, along with how to boost their grades. He lends even more time as a career speaker, sharing best practices about his own journey to his current position with the Cubs. "This program targets student development in academics and character, and it's very rewarding to watch your student grow in both areas." Kevin Saghy is manager of communications for the Chicago Cubs. In this role, he is responsible for promoting the team's marketing and ticketing efforts, community involvement and other off-the-field endeavors through various communications channels, while also leading the club's overall social media efforts. Thank You and Congratulations, Cathy and Kevin!